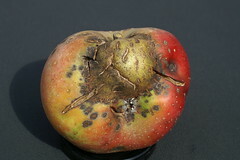 Apple scab is a fungus disease caused by Venturia inaequalis. It is of major economic importance and, if not controlled, can cause extensive losses (70% or greater) where humid, cool weather occurs during the spring months. Losses result directly from fruit or pedicel infections or indirectly from repeated defoliation, which can reduce tree growth and yield. Apple scab lesions occur on leaves, petioles, blossoms, sepals, fruit, pedicels, and less frequently, on young shoots and bud scales. The first lesions often occur on the lower surfaces of leaves as the leaves emerge and are exposed to infection in the spring. Later, as the leaves unfold, both surfaces are exposed and can become infected. Young lesions are velvety brown to olive green and have feathery, indistinct margins (Fig. 1). With time, the margins become distinct but may be obscured if several lesions grow together. As an infected leaf ages, the tissues adjacent to the lesion thicken, and the leaf surface becomes deformed (Fig. 2). Young leaves may become curled, dwarfed, and distorted when infections are numerous. 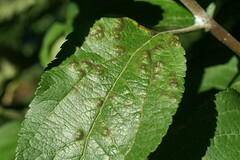 The lesions may remain on the upper and lower leaf surfaces for the entire growing season; occasionally, the underlying cells turn brown and die so that brown lesions are visible on both surfaces. The number of lesions per leaf may range from one or two to more than a hundred. The term "sheet scab" refers to leaves whose entire surfaces are covered with scab. Young leaves with sheet scab often shrivel and fall from the tree. Infections of petioles and pedicels result in premature abscission of leaves and fruit, respectively. In late summer or early fall, lesions may appear whitish due to the growth of a secondary fungus on the lesion surface. Lesions on young fruit appear similar to those on leaves, but as the infected fruit enlarge, the lesions become brown and corky (Figs. 3, 4). Infections early in the season can cause fruit to develop unevenly as uninfected portions continue to grow. Cracks then appear in the skin and flesh (Fig. 4), or the fruit may become deformed. The entire fruit surface is susceptible to infection, but infections early in the season are generally clustered around the calyx end. Fruit infections that occur in late summer or early fall may not be visible until the fruit are in storage. This syndrome is called pinpoint scab and is characterized by rough, circular, black lesions ranging from 0.004 to 0.16 inch in diameter. 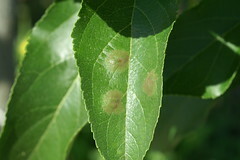 Although research in New York has shown that the scab fungus can overwinter in trees as conidia on bud scales, the pathogen generally overwinters in leaves and fruit on the orchard floor. Ascospores are the major source of primary inoculum and are produced within pseudothecia that develop in leaves during the winter months. In a typical year in most locations, the first mature ascospores are capable of causing infections at about the time of bud break or soon thereafter. Ascospores continue to mature and are discharged over a period of 5 to 9 weeks, with peak discharge during the pink to petal fall phenological stages. The length of time required for infection to occur depends on the number of hours of continuous wetness and the temperature during the wet period. (See Apple Scab Infection Timetable for information about how long it takes an apple scab infection to occur and conidia to develop during wet periods at various temperatures.) Young leaves remain susceptible for 5 to 8 days, but their lower surfaces may become infected in late summer. For fruit, the duration of the wet period required for infection increases with the age of the fruit, which remains susceptible until harvest. Once the fungus is established in the leaf or fruit, conidia form on the surface of the lesion and become the source of secondary inoculum for the remainder of the season. Conidia are disseminated to developing leaves and fruit by splashing rain and wind. Several secondary cycles of conidial infection may occur during the growing season, depending on the frequency of infection periods and the susceptibility of host tissue. Management of apple scab is multifaceted. You may use resistant cultivars, sanitation, and chemical control in varying degrees, depending on the orchard system you are using and your goals. Most major apple cultivars are susceptible to apple scab, although susceptibility varies somewhat. (See Table of Apple Cultivar Susceptibility to the Apple Scab Fungus for more information.) Breeding programs to develop high-quality disease-resistant apple cultivars are underway at the New York State Agricultural Experiment Station in Geneva and cooperatively among Purdue University, Rutgers University, and the University of Illinois. In addition, several foreign countries have active apple breeding programs with disease resistance as an objective. More than 25 scab-resistant cultivars have been released, included 'Prima', 'Priscilla', 'Jonafree', 'Redfree', 'Liberty', 'Freedom', 'Goldrush', 'Enterprise', 'Crimson Crisp', and 'Pristine'. Most are adapted to the more northern apple-growing areas of the United States. All scab-resistant cultivars vary in their susceptibility to other early-season diseases; and all are susceptible to the summer diseases. (See Table of Apple Scab Resistant Cultivar Susceptibility to Other Diseases for more information.) Some recently released apple cultivars that have not been bred specifically for resistance to scab show varying levels of scab susceptibility, also. Prevention of pseudothecial formation in overwintering apple leaves probably would eliminate scab as a serious threat to apple production in the United States. However, complete elimination of pseudothecia is not possible under orchard conditions with current methods. To reduce the potential for severe scab, growers use several methods that vary in practicality, depending on orchard size. You may use leaf pickup and destruction in late autumn if your orchard is extremely small, although diseased leaves from neighboring areas can blow in. Using flail mowing in late autumn to chop litter can help reduce numbers of pseudothecia. Using applications of 5% urea on foliage in autumn can hasten leaf decomposition, thus reducing formation of pseudothecia. Make such applications just prior to leaf fall to avoid stimulating tree growth and predisposing the trees to winter injury. 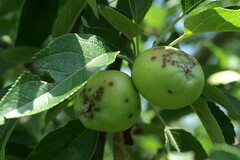 Growers control apple scab primarily with fungicide sprays. A variety of fungicide sprays with differing modes of action are available. When and how you use them depends on their mode of action. Protectant fungicides prevent spores from germinating or penetrating leaf tissue. For these fungicides to be effective, you must apply them to the surface of susceptible tissue before infection occurs. You can make predictions about when infection may occur by using an accurate weather forecast and the Mills table referenced previously. Apply protectant fungicides routinely at 7- to 10-day intervals, or according to anticipated infection periods. Postinfection fungicides control the scab fungus inside leaves and fruit. These chemicals can penetrate plant tissues to eliminate or inhibit lesion development. The ability of these fungicides to stop infections is limited to a few hours, or up to few days (depending on the specific fungicide), and often varies with temperatures during the first 24 to 48 hours after infection. Some fungicides can inhibit the fungus even later in the incubation period (the time between infection and the appearance of symptoms). You can eradicate scab lesions by attending to proper rate and timing when applying certain fungicides. Base your selection of fungicides for management of scab on several factors, including the entire spectrum of other diseases you must manage at the time, the potential for resistance in the scab fungus to the selected chemical, the history of the disease in a particular orchard, the final market for the fruit, and other social and economic factors. Good horticultural practices, such as proper site selection and tree spacing and annual pruning, facilitate chemical control by improving spray coverage and reducing the length of wet periods. Original text prepared by A. R. Biggs and K. D. Hickey. The original version of this article appeared in The Mid-Atlantic Orchard Monitoring Guide (NRAES-75) and is reproduced with permission from the Natural Resource, Agriculture, and Engineering Service, Cooperative Extension, 152 Riley-Robb Hall, Ithaca, New York 14853-5701, U.S. A. (607) 255-7654. It has been edited for presentation here by Alan R. Biggs, West Virginia University.